One Arm Point Remote Community. (2010). 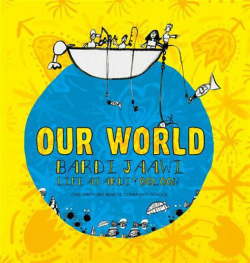 Our World: Bardijaawi: Life at Ardiyooloon. Broome, Western Australia: Magabala Books Aboriginal Corporation. This text has been chosen specific for this unit plan with a main focus on English & Science. The designated lesson plans will be inclusive with the Australian Curriculum Cross Curriculum Priorities 'Aboriginal & Torres Strait Islanders Histories and Culture'. These lessons will give students an opportunity to demonstrate, acknowledge and understand Aboriginal & Torres Strait Islander Histories and Cultures. This unit plan will provide opportunities for all learners to deepen their knowledge of Australia by engaging with the world's oldest continuous living cultures. This knowledge and understanding will enrich their ability to participate positively in the ongoing development of Australia (The Australian Curriculum, 2014). From an early age, children at One Arm Point Remote Community School have grown up learning skills and gaining cultural knowledge and experiences, that many children from urban Australian schools may not have experienced. All activities in this book were carried out under culturally appropriate responsible adult supervision. Indigenous people are the caretakers of their land and, as such, have the right to use their land in ways that may be prohibited in certain parts of Australia. The Ardiyooloon community is situated on the northern tip of the Dampier Peninsula in the Kimberley Region of Western Australia. This community survives off the land and the sea, they are surrounded by crystal blue waters and white sandy beaches.